Background and objectives There is a need for prediction scores that identify individuals at increased risk for developing progressive chronic kidney disease (CKD). Therefore, this study was performed to develop and validate a “renal risk score” for the general population. Design, setting, participants, & measurements For this study we used data from the PREVEND (Prevention of Renal and Vascular ENdstage Disease) study, a prospective population-based cohort study with a median follow-up of 6.4 years. Participants with two or three consecutive estimated GFR (eGFR) measurements during follow-up were included. Participants within the group who had the most renal function decline (top 20% of the total population) and had an eGFR value <60 ml/min per 1.73 m2 during follow-up were defined as having progressive CKD. Possible predictors for progressive CKD were selected on the basis of univariable logistic regression analyses. Results A final prediction model was built using backward logistic regression analysis. Besides baseline eGFR, the model contained age, urinary albumin excretion, systolic BP, C-reactive protein, and known hypertension. The area under the receiver operating characteristic (ROC) curve was 0.84. We performed internal validation by using a bootstrapping procedure. As expected, after the regression coefficients were corrected for optimism, the area under the ROC curve was still 0.84. For clinical use we divided all predictors in meaningful clinical categories to develop a score chart. The area under the ROC curve was 0.83, indicating the high discriminative value of this model. Conclusions Given the high internal validity of this renal risk score, this score can be helpful to identify individuals at increased risk for progressive CKD. In past decades, epidemiologic studies performed in Japan, Europe, and the United States have shown that the prevalence of chronic kidney disease (CKD) is high (1–3). A large study performed in the United States population showed that 16.8% of the population aged ≥20 years has CKD (4). Many of these individuals are not aware of having CKD (5). On the basis of these results, screening for CKD has been suggested. Several studies identified risk factors for CKD progression or increased renal function loss (6–12). However, it is also known that only a relatively small percentage of the individuals with CKD eventually reach end-stage renal disease. It is even true that in patients with CKD the rate of decline in GFR varies, and even increases in GFR are common (13). Therefore, the next step should be to identify those individuals who are most likely to have progressive CKD. In these individuals intervention could be applied in an early phase of their disease to prevent morbidity associated with impaired renal function and to slow down the rate of renal function decline with the hope of postponing or even preventing the need for renal replacement treatment in the long run. To do so, “renal risk scores” should be developed that could be helpful tools to predict renal outcome for individuals. The need for such scores has been advocated in recent reviews, among others, by Taal and Brenner (14–16). The aim of this study was to develop a renal risk score to predict the risk for progressive CKD based on the values of several renal risk factors. For this study we used data of the PREVEND (Prevention of Renal and Vascular ENdstage Disease) cohort, an ongoing population-based cohort study. The analyses included data of participants who participated in the first three screening rounds of the PREVEND study. In summary, this is a prospective, community-based cohort study, designed to investigate the association between urinary albumin excretion (UAE) and renal and cardiovascular outcome in the general population. In 1997 through 1998, all inhabitants of the city of Groningen aged 28 to 75 years were sent a questionnaire and a vial to collect a first-morning-void urine sample. Of these participants, 40,856 responded (47.8%) and returned a vial to a central laboratory for urinary albumin and urinary creatinine assessment. From these 40856 participants, the PREVEND cohort was selected with the aim to create a cohort enriched for the presence of high albuminuria. After exclusion of patients with type 1 diabetes mellitus (defined as requiring the use of insulin) and pregnant females (defined by self-report), all participants with a urinary albumin concentration of >10 mg/L (n = 7768) were invited, and 6000 participated. Furthermore, a randomly selected control group with a urinary albumin concentration of <10 mg/L (n = 3394) was invited, and 2592 participated. These 8592 participants constitute the actual PREVEND cohort. Participants are invited to visit an outpatient clinic for a medical examination at approximately 3-year intervals. More details of the study protocol have been published elsewhere (17–19) and can be found at www.PREVEND.org. In total 8592 participants completed the first screening round in 1997 through 1998. 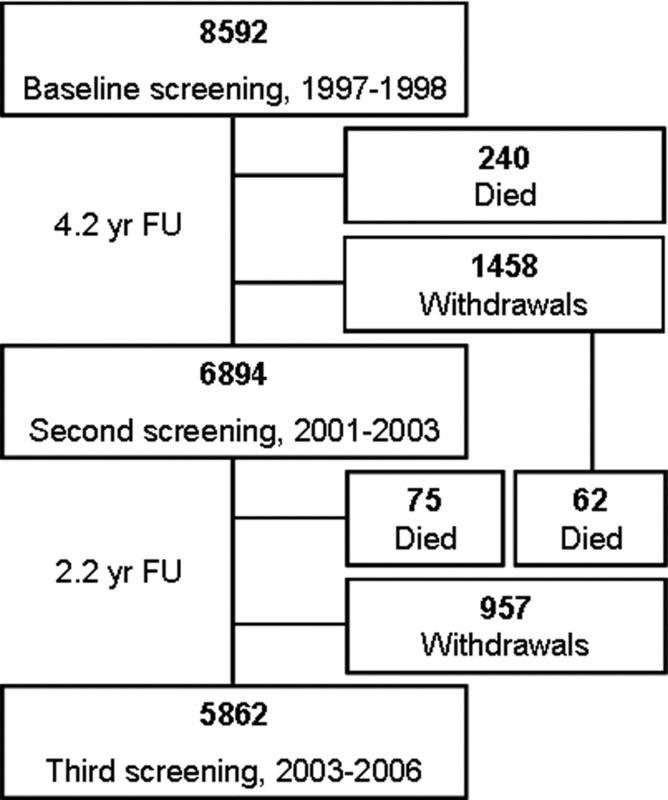 The second screening round (2001 through 2003) was completed by 6894 (80.2%), whereas the third screening round (2003 through 2006) was completed by 5862 (68.2%) participants (Figure 1). For this study, we excluded participants for whom no follow-up estimated GFR (eGFR) value was available (n = 1699) and also participants with an eGFR value <45 ml/min per 1.73 m2 at the first screening round (n = 64). In general, these latter participants would already have been regarded as participants with a high renal risk and would have been referred to specialist care or intervention by a general practitioner would have taken place. Furthermore, we excluded participants who indicated having a renal disease during the first screening round (n = 20). Included for the present study are therefore 6809 participants who had two or three eGFR measurements available during follow-up. Outline of the PREVEND study; first three screenings. The follow-up times are given as median values. FU, follow-up. The PREVEND study was approved by the local medical ethics committee and conducted in accordance with the guidelines of the Declaration of Helsinki. All participants gave their written informed consent. Each screening round consisted of two visits to an outpatient department separated by approximately 3 weeks. Participants filled out a questionnaire on demographics, cardiovascular and renal disease history, smoking status, and the use of oral antidiabetic, antihypertensive, and lipid-lowering drugs. Information on drug use was completed with data from community pharmacies, including information on class of antihypertensive medication (e.g., ACEi/ARB). On the first and second visits, BP was measured in the right arm every minute for 10 and 8 minutes, respectively, by an automatic Dinamap XL Model 9300 series device (Johnson & Johnson Medical Inc., Tampa, FL). For systolic and diastolic BP, the mean of the last two recordings from each of the 2 visit days of a screening round was used. Anthropometrical measurements were performed, and fasting blood samples were taken. Concentrations of total cholesterol and plasma glucose were measured using standard methods. Serum creatinine was measured by dry chemistry (Eastman Kodak, Rochester, NY), with intra-assay coefficient of variation of 0.9% and interassay coefficient of variation of 2.9%. eGFR was estimated using the Modification of Diet in Renal Disease (MDRD) study equation, taking into account gender, age, race, and serum creatinine (20). In addition, participants collected urine for two consecutive periods of 24 hours. Urinary albumin concentration was determined by nephelometry (Dade Behring Diagnostic, Marburg, Germany), and UAE was given as the mean of the two 24-hour urinary excretions. As a proxy for dietary sodium and protein intake, we used the 24-hour urinary excretion of sodium and urea, respectively. A history of cardiovascular disease (CVD) was defined as having a history of myocardial infarction and/or a history of a cerebrovascular accident for which the individual had been admitted to a hospital, as indicated on the baseline questionnaire. “Known hypertension” and “known diabetes” were noted when participants received medical treatment for these conditions or when the patient indicated this on the questionnaire. Family histories for CKD and coronary heart disease were based on information about first-degree relatives (data from questionnaires). Smoking was defined as current smoking (including participants who quit smoking for <1 year before the screening) or nonsmoking (including participants who quit smoking at least 1 year before the screening). Change in renal function was calculated as the slope of the linear regression line through all available eGFR (two or three) measurements (expressed in ml/min per 1.73 m2 per year). Participants were defined as having progressive CKD when they belonged to the group of participants with the most renal function decline (top 20% of the total population) and with an eGFR value <60 ml/min per 1.73 m2 during follow-up. Continuous data are reported as mean and SD. For skewed distributions, median and interquartile range are presented. All P values are two-tailed. A P value <0.05 is considered to indicate statistical significance. As possible predictors for progressive CKD, we used variables that were obtained at the first screening round and that have been suggested in the literature to be renal risk factors: age, gender, CVD history, known hypertension, known diabetes, family history for CVD, family history for CKD, smoking, systolic BP (SBP), body mass index, eGFR, plasma total cholesterol, glucose, triglycerides and C-reactive protein (CRP), urinary albumin excretion (UAE), and daily intake of sodium and protein. First, we analyzed univariable associations between these predictors and incident progressive CKD using logistic regression analysis. Variables that had an association with the outcome measure with a P value <0.2 were selected for multivariable analysis. Second, a multivariable model was built using backward selection, which will be used as the final model with the continuous predictors. Values of UAE, CRP, and triglycerides were logarithmically transformed to fulfill the requirement of linearity of the logit. The final model was tested for possible nonlinear associations between continuous predictors and incident progressive CKD by adding quadratic terms. Quadratic terms with a P value <0.05 were considered significant and were added to the model if necessary. Furthermore, clinically meaningful interactions (between age, SBP, and gender) were tested. The performance of the final model was evaluated by analysis of the area under the receiver operating characteristic (ROC) curve. The internal validity of the prediction model was evaluated by bootstrapping (21). Two hundred samples of equal size were drawn at random and with replacement from the complete dataset. In these bootstrap samples, the coefficients of the final regression model were estimated and tested in the original sample. The difference between the coefficients in the original sample and bootstrap samples as reflected by the slope index is the measure for the amount of “optimism” (22). Normally, slope values lie between 0 and 1. A slope value of 1 means no optimism. The slope index was used as a shrinkage method by multiplying coefficients with this slope index to correct for optimism. Prediction of an Individual Patient's Risk. The linear predictor (lp) consists of the regression coefficients estimated in the final model, multiplied by the values of each predictor for each patient. To facilitate calculation of an individual participant's risk in clinical practice, analyses were also performed with the predictors of the final prediction model divided in clinically meaningful categories (see Table 4). With this model a numerical score chart was derived by rounding up the estimates of the corresponding regression parameters obtained from the model. The performance of this model was also evaluated by analysis of the area under the ROC curve. The diagnostic characteristics of this model in terms of sensitivity, specificity, positive predictive value, and negative predictive value were calculated. All logistic regression analyses were weighted to adjust for the enrichment of our study cohort with participants with higher levels of albuminuria. Analyses were conducted with the use of the statistical package SPSS 16.0 (SPSS, Inc., Chicago, IL) and bootstrapping was performed in R version 2.10.1 for Windows (23). Several sensitivity analyses were performed. First, we repeated the analyses excluding participants with a baseline eGFR <60 ml/min per 1.73 m2 or eGFR <65 ml/min per 1.73 m2. Second, the analyses were repeated including only participants with data available from all three screening rounds (n = 5862). Third, we used the Chronic Kidney Disease Epidemiology Collaboration (CKD-EPI) equation to estimate GFR instead of the MDRD equation and repeated all analyses. During a median follow-up of 6.4 years (37,384 person-years), 272 participants complied with our definition of progressive CKD. The baseline characteristics of these 6809 participants who were included in these analyses were comparable with the participants who did not participate in follow-up screenings concerning age, glucose, cholesterol, and eGFR. The participants who were not included had a slightly higher UAE (9.1 versus 11.2 mg/24 h) and SBP (128 versus 133 mmHg). Table 1 shows the baseline characteristics of the 6809 participants with and without progressive CKD. The participants who met the definition of progressive CKD were older and had a worse cardiovascular risk profile (e.g., higher BP, lipid levels, glucose and UAE, and a lower baseline eGFR). With this prediction rule, the probability to develop progressive CKD within 6.4 years of follow-up can be calculated for each individual. The area under the ROC curve for this model was 0.84 (95% confidence interval [CI] 0.82 to 0.86), indicating that the discrimination of the model is high. For clinical use, a model was built with the predictors divided into clinically meaningful categories (results are presented in Table 4). The regression coefficients of this model are also corrected for “optimism” by multiplying the coefficients of the original model by the shrinkage factor (shrinkage = 0.97). The accompanying score chart, based on the coefficients of the model in Table 4, is presented in Table 5. The area under the ROC curve was 0.83 (95% CI 0.80 to 0.85), indicating that the discrimination of the model is also high. The diagnostic characteristics of the model including categorical predictors are given in Table 6. The results of the sensitivity analysis excluding participants with a baseline eGFR <60 ml/min per 1.73 m2 or eGFR <65 ml/min per 1.73 m2 were comparable with the primary analyses. These models included almost the same predictors and the strength of the predictors was also comparable, the only differences being that for the analyses excluding participants with an eGFR <60 ml/min per 1.73 m2 or an eGFR <65 ml/min per 1.73 m2 at baseline the predictor “known diabetes” could be added. In the model excluding individuals with an eGFR <65 ml/min per 1.73 m2, the predictor “systolic BP” lost significance (although the odds ratio was still of similar strength). The results of the analyses including only participants with data available from the three screenings were fully comparable with the primary analyses. Using the CKD-EPI equation instead of the four-variable MDRD equation to estimate GFR again rendered essentially similar results, with the only difference being that “known diabetes” could be added to the model as a predictor. A complete overview of the results when applying the CKD-EPI equation is provided as Supplemental Web Appendix (Supplemental Web Appendix includes Supplemental Tables 1 to 6). In this study we developed and validated a renal risk score for the general population to identify individuals at risk for progressive CKD, with progressive CKD being defined as belonging to the group of participants with the most rapid renal function decline and an eGFR <60 ml/min per 1.73 m2 during follow-up. Besides baseline eGFR, urinary albumin excretion, SBP, CRP, and known hypertension predict the risk of progressive CKD. The area under the ROC curve for this model including continuous data was 0.84 (95% CI 0.82 to 0.86), showing that the discriminative ability of the prediction model was good. After internal validation, performed by bootstrapping, the performance of the model remained 0.84. For clinical use, we developed a score chart using predictors divided into clinically useful categories. This score chart offers the possibility to easily determine the risk of progressive CKD for an individual patient. Recently, several prediction models have been developed to predict the new-onset CKD or the progression of renal disease. In general, these prediction models are developed for high-risk populations, such as populations with known underlying CVD (24) or with a known renal disease such as IgA nephropathy (25), diabetes type 2 and nephropathy (26), and renal artery stenosis (27). To our knowledge, only two prediction models have been developed in the general population to identify individuals with CKD or at risk of developing CKD. The first prediction model, named SCORED (Screening for Occult Renal Disease), predicts the risk of prevalent CKD (defined as eGFR <60 ml/min per 1.73 m2) for an individual. This model was developed in a general population (n = 8530), comparable with the population we used for our model, and used cross-sectional data. Consequently, this model cannot predict which individuals are at high risk to develop progressive CKD during follow-up. The authors were able to predict the risk of prevalent CKD based on age, gender, and the presence of several health conditions (anemia, hypertension, diabetes, history of CVD, history of congestive heart failure, peripheral vascular disease, and proteinuria). The area under the ROC curve (0.88) was good, and also the performance in an external dataset was acceptable (UAC of the ROC curve 0.71) (28). The second prediction model was developed in a population-based cohort in the United States and resulted in a prediction model for incident CKD (defined as eGFR <60 ml/min per 1.73 m2) within a follow-up of 9 years (29). The authors also performed a sensitivity analysis defining CKD as developing an eGFR <60 ml/min per 1.73 m2 and a renal function decline of at least 10 ml/min per 1.73 m2 during the 9-year follow-up period. This latter outcome is comparable with the definition we use for progressive CKD. In the final prediction model they included age, race, gender, anemia, hypertension, diabetes mellitus, history of CVD or heart failure, and peripheral vascular disease. The performance of this model was reasonable with an area under the ROC curve of 0.70. A comparison between the results of this study and the study we performed shows that both models include age and known hypertension as predictors. However, the area under the ROC curve in our study is higher. This difference can be explained by the fact that the nature of the data we used is not comparable. Instead of dichotomized data, we included continuous data, such as level of SBP, in our analyses. Importantly, in our final model two well-acknowledged renal risk markers were taken into account, namely, baseline albuminuria and renal function. Our results show that baseline eGFR, and to a lesser extent also baseline albuminuria, contribute significantly to risk prediction. How could our prediction model be implemented in clinical practice? Our results show that it is possible to predict the risk of having progressive CKD within a 6.4-year follow-up for individuals based on demographic data and relatively simple laboratory measurements. Of course, deciding which cutoff values to adopt indicating high risk is rather arbitrary. Positive and negative predictive values should be weighed against each other. Furthermore, the relevance of the end point is important, with relevance being assessed by the individuals involved themselves and by the health care system. The importance of progressive CKD as defined in this study may be regarded by some not to be comparable with, for instance, death or a major cardiovascular event. On the basis of the present data, we propose to adopt a score of 27 or higher to indicate high risk. A score of 27 or higher is found in only 2.1% of the population, and of these participants 28.1% will have progressive CKD during follow-up. This high risk may justify the start of renoprotective treatment. Adopting this cutoff results in a relatively large proportion of the participants with progressive CKD being missed (84.3%). Introducing an intermediate-risk class could be a solution to this problem. Participants with a score of 21 through 26 account for 12.7% of the population and 35.3% of the participants with progressive CKD. Their risk to develop progressive CKD is 16.4%. These participants could be asked to visit a screening facility to obtain a repeat measurement of eGFR in, for instance, 2 and 4 years. Only those with proven decline in renal function during follow-up should start renoprotective treatment. These data show that our prediction model can be used as a powerful tool to improve clinical decision making. One of the strengths of our study is the use of a large cohort for the development and validation of the prediction model. In addition, we were able to develop a score chart, an easy tool for clinical practice. Such a score chart facilitates the calculation of the probability for individuals to have progressive CKD within 6.4 years of follow-up. Also, the inclusion of only baseline characteristics that are relatively easy and inexpensive to measure is an advantage. The choice of the definition for progressive CKD is also a strength of this study. In addition to including the criterion of reaching an eGFR <60 ml/min per 1.73 m2 during follow-up, a criterion of a minimum rate of renal function decline prevents the selection of participants with a baseline eGFR near the threshold of 60 ml/min per 1.73 m2 who have only limited loss in renal function during follow-up. In our opinion, such patients should not be labeled as having progressive CKD. Of course, limitations of our study need to be mentioned. First, the prediction model we describe in this study is developed in a predominantly Caucasian population and is therefore not necessarily valid for other populations, as are NPV and PPV, being statistical measures dependent on the population under study. Second, this study was not performed with isotope dilution mass spectrometry–traceable serum creatinine values. Therefore, we used the four-variable MDRD equation to estimate eGFR. Third, in the PREVEND cohort detailed information on participants' characteristics is available. However, it is possible that there are relevant risk factors that are not measured within our cohort. Fourth, we developed our risk score in individuals who survived until the second screening round. Therefore, we cannot rule out the effect of survival bias. Fifth, validation was performed internally and without data of another cohort (external validation). In the literature, several methods for internal validation have been suggested. Of these methods the bootstrapping method is recommended (22). By application of this method, it appeared that “optimism” was very small and, therefore, the internal validity of our model was high. High internal validity is generally seen as an indicator for good external validity (21). Sixth, although our risk score identifies patients at risk for progressive CKD, additional research on ways to decrease the rate of renal function decline in high-risk individuals is needed. Lastly, the cost-effectiveness of screening programs should be determined. This study should be seen as a first, important step toward the design of such studies. In conclusion, we developed and validated a renal risk score for the general population to predict for individuals the risk of progressive CKD. The final model showed that the individual risk of progressive CKD can be assessed by eGFR, age, SBP, UAE, CRP, and known hypertension. The discriminative ability of this model, and the results of internal validation, showed that the performance of the model was good. We thank Dade Behring (Marburg, Germany) for supplying equipment (Behring Nephelometer II) and reagents for nephelometric measurement of urinary albumin concentration. The PREVEND Study has been made possible by grants of the Dutch Kidney Foundation.